This entry was posted on 26 July 2017 at 21:53 and is filed under human resources. You can subscribe via RSS 2.0 feed to this post's comments. Hi Ryan, I like this simple model. One gap I now notice in my model is Health and Wellness which, as you can imagine is pretty important in those sectors. They call it Duty of Care. So I’ll see if I can cram that into future versions, somewhere around Coaching and Mentoring. Ryan, while it is the performance bit that is probably the bread and butter of my life. It is the on and off boarding which I fine really interesting and are the areas which really seem to be neglected. 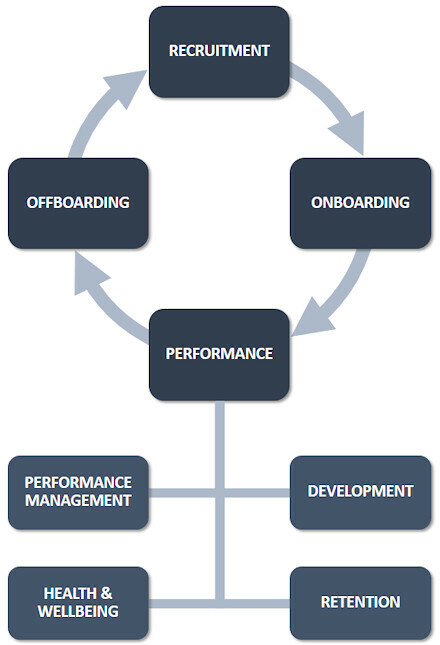 Often Onboarding is viewed from that induction and compliance point of view. That what do we need to do to make sure we have ticked all of the legal boxes approach. Offboarding for most organisations is farewell morning tea and an exit interview (providing you haven’t been pushed). In a previous role, we looked really hard at both of these processes’ Onboarding from the preservative of what do we need to do (beyond the standard stuff) to get the new staff member up to speed and effective as soon as possible an doffboarding from the perspective of how can we make this experience as useful as possible, particularly in terms of making the organisation the first pick for reemployment at a later date. Interestingly we found it much easier to get engaged in the on side of the process rather than the off side. The other issue here is that often all of these areas are dealt with by different departments or areas, with no one actually looking over all of them and trying to create a holistic approach. This is a really useful model. I particularly appreciate the reflective questions for L&D. I agree with you and Paul that offboarding is often handled really poorly and it should be given much more importance. – What do we learn from our employees as they exit about our organisation’s culture? – What do we learn from our employees as they leave about our systems, processes, tools etc? – What do we learn from our exiting employees about how we manage people? 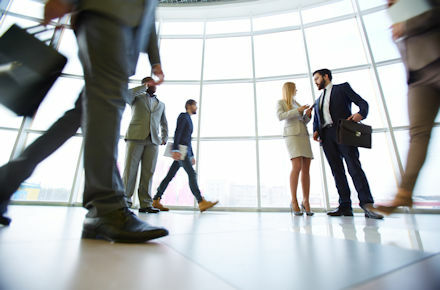 Exit interviews can be fraught, especially if the circumstances are undesirable or where the person leaving feels they cannot give an honest reflection. But at the same time, exit interviews are important to show that you respect and value the employee’s viewpoint. In the case where it is a long-term/senior/managerial person leaving, exit interviews are an important measure of good governance. Finally, offboarding is an important way of ensuring (as Paul stated) that you ensure good relations with the person departing. You never know when paths might cross again. I am reviewing the HR function where I work, and if okay with you, I would love to use your model and questions as a road map in my exploration to test it out. Excellent! By the way, I’m not anti complex systems, it’s just that for my purpose at the time, a simple model was called for. I see that your model in the slide is necessarily more complex because it relates to the badging of the employee’s journey at key points. Indeed, while I make the point that offboarding is often neglected by the employer, I agree with you that onboarding is too. The onboarding process is typically one of telling the new recruit what he or she has already read on the website, plus ensuring they complete their mandatory e-learning modules. The onboarding experiences that are put up on a pedestal usually involve some form of box or pack on the new recruit’s desk. While this is a great start, it’s not enough; yes it’s admirable to make the recruit feel welcome, but they also need to become productive. Case in point – I received such a welcome pack from a colleague (not the employer) and it was awesome; I felt valued by her. The rest of the onboarding experience, however, was a disaster; I felt impotent and useless without an email address, access to the shared drive, wireless connectivity, etc. As for offboarding, I would consider it a big plus if the employer did do an exit interview (many don’t). You make a great point about re-employment at a later date, and of course the intelligence obtained through the process could be used in service of the existing employees. I’d be honoured if you used my model! I published it to share, and if someone such as yourself can extract value from it, I’m delighted. I think those questions you offer for the exit interview are excellent, yet I also wonder about the honesty of the interviewee. While a fool would burn bridges, an ethical professional who has something negative to say should do so constructively. How many among us would rather say nothing substantive at all? Adding to Paul’s point about the exit interview being run by different areas, I also wonder if anything is really ever done with the results. Hey Ryan this is interesting especially because employee is just looked down upon as a resource. Happy that you have chalked out the lifecycle aspect. 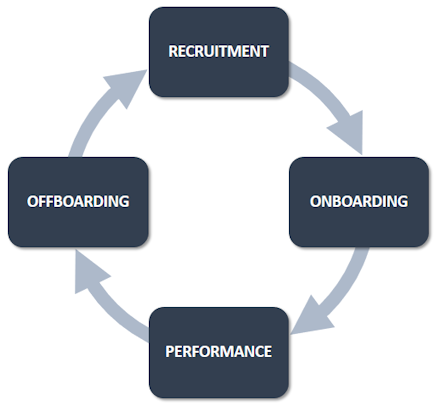 Suggest you expand the graphic for the other 3 parts too especially on offboarding and onboarding, where would reboarding fit ? I have worked 3 years on 2 occasions for the same company after a brief gap. Their work culture was a powerful reason for me to do so. Interesting, Amit. I wonder if you have to do your compliance modules again? Lol. But seriously, I suppose reboarding would be a subset of onboarding, whereby value could be added by reactivating LMS transcripts etc.